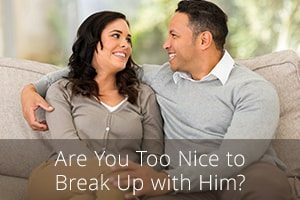 Are You Too Nice to Break Up with Him? You’ve been dating for a while. He’s a good guy. A really good guy. He’s nice, your parents like him, he’s got a solid career, and he picks up after himself. The thought of walking down the aisle with him fills your heart with dread. Because he has some habits that really bother you. And you’re not sure if it’s just a phase or the beginning of a downward spiral. Stick with it and hope things get better? I’m going to offer a different suggestion. One that goes counter to everything most people do. If you’re like most people, you don’t pay a lot of attention to those relationship doubts at first. It’s not like you’re committed. But if your girlfriends ask, you’re honest. You mention your reservations about him. They’re encouraging. They want you to be happy. They want to see you with someone who’s good for you. So you go back to him, and you keep seeing each other. You take each day as it comes. Besides, your relationship is comfortable. It’s much better than being single. He doesn’t seem to be in any hurry to have “The Talk” about your future, so you don’t have to decide anything yet. Is this state of indecision serving you? 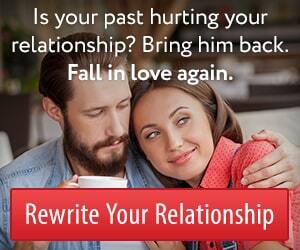 Is it serving your relationship? And what about him? 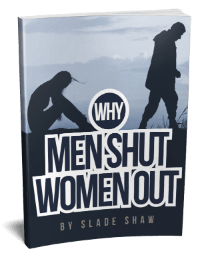 Are you completely certain he’s in the dark about your doubts? Does he really have no clue you’ve got one foot in the relationship and one foot out? Avoiding the topic so neither of you have to face the uncomfortable truth that you might not be suited to each other? That’s why I suggest doing something that might hurt a bit but will ultimately serve your relationship (and you) better in the long run. Be open about your feelings from the start. You have doubts? Ok, then talk to him about them. He’ll break things off on the spot. Why risk destroying your relationship when the relationship is still mostly enjoyable? Because he deserves to know. And you deserve an honest relationship where you don’t have to hide what you’re feeling. So many relationships start with little white lies. “Oh, I loved that movie, too!” when you really thought it was lame. “I’d love to go to the game with you!” when it’s the last thing you want to do this weekend. We say those things to build connection. Our intentions are good. But over time we can’t keep it up. We have to reveal our true thoughts and feelings. We have to trust that our connection is strong enough to cope with our differences. Old habits die hard. Sometimes it’s easier to fall back into the habit of keeping your true thoughts and feelings to yourself. Especially if what you’re thinking might hurt him or change his feelings about you. That’s why so many couples keep their true feelings about one another to themselves. They’re used to holding something back. They’re worried their relationship can’t handle complete honesty. Some relationships can’t … and they don’t tend to last very long. So, yes, he might feel hurt. He might get mad. He might break things off. But he might do something else. Depends on the man you chose. If he is the wrong man, he’ll make you feel terrible for saying anything. His ego will be so outraged by your truth that he may even end the relationship there and then. Thank goodness. Now you really know he wasn’t the right guy for you. You can jump back into the dating pool with a free and easy heart. But if this man listens to you and hears what you’re saying, even though he doesn’t like it, then you may have underestimated him. He may be willing to do whatever it takes to keep you in his life, because he sees that what you have together is special and irreplaceable. And then you’ll embark on a new journey together. One of listening to each other’s needs, rather than pretending everything is okay when it’s not. It may not last, but at least it will be honest. And that will feel pretty darn good for a change. James,that is one of my favorite posts.Well said. He is caring,does listen and it is so easy to love him , while I have some reservations ,I have understood that they mainly come from my own insecurities and he is able and will to talk about and support me to overcome them . If he blows up, he’s not the One. Got it.